Spontaneous Tourism: Blogging around the World: Is Business Class getting worse? Is Business Class getting worse? 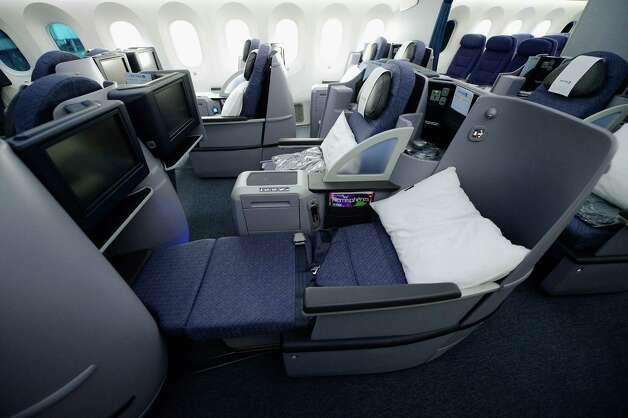 With the current emphasis on lie-flat beds, it is easy to overlook the extent to which the transition from “seats” to “suites” in long-distance First and Business Class seating has actually been accompanied by a drastic reduction in space afforded to passengers. Having flown more than a million miles over the last ten years, with perhaps six to ten flights in Business Class in each of those years, I have first-hand experience with the seating changes made by two airlines in particular over that time—United and Continental, which merged in 2009 but, as with all such mergers, still have planes in circulation with a variety of interior configurations and seating styles. It was not until a trip to and from Hawaii this past week, however, that I had the opportunity to compare the current state-of-the-art seating for United, the kind installed in its recently acquired 787 Dreamliners, with what was standard Business Class seating when I first started flying. To be clear, the old Business Class seats did not turn into beds. These seats were (are) effectively large armchairs, able to lean back about 60 degrees and with extended footrests that came up about as far. Movement was mechanical. The state-of-the-art seats, which United refers to as “suites,” use electric controls. They always have digital touchscreen entertainment systems and 110v universal power outlets, versus the old seats that only occasionally offered such options; on my last flight, for instance, we were invited to use United’sservice to stream video to our own devices, which sounds good in theory but was incompatible with my Android phone and could not be made to work on my Windows 8.1 tablet, even after downloading a Panasonic DRM plug-in. In terms of comfort, however, the hard truth is that the award goes to the old seats over the new suites. When one sits down in these old seats, there is so much room that it is almost impossible to reach the seatback pocket. If the person beside you reclines all of the way, and you need to get up, there is no hassle. As far as width goes, someone sitting in an old-style Business Class seat has no more seating space than in a new suite, but the suites channel one’s feet into small, cramped compartments rather than expansive footrests, and, in the latest-model suites, the powered leg-rests that fill in the gap between the main seats and those compartments leave a considerable gap unless the seat is fully reclined into bed mode, making them far less comfortable while lounging. As for bed mode itself, I can speak only as someone who is a little over six feet tall, but I find the reclined suites to be cramped. Lying on my side is virtually impossible with the squished “foot storage” that serves as the bottom of the “bed,” and the presence of the hard headrest cannot be offset with a soft pillow. The prior version of the suite was better with regards to the two issues—it had a longer leg-rest and a wider footrest—but the “beds” themselves are rather uncomfortable. Despite the allure of lying completely flat, which I naively try each and every time I fly in an upgraded class on an international flight, I invariably end up in more of a “recliner” position. In other words, I find that the new suites work best when they are imitating the best that the old seats could provide, and the old seats did it better. To be sure, my experience in this regard is particular to United, because United (since the merger) is the only carrier with which I have the miles and credits to travel in upgraded seats on international flights. As far as United goes, however, most of my international flights at this point are taken in BusinessFirst—that is what they call their Business Class seating, a carryover from Continental—and, while I have generally good things to say about the experience, including very good food and exceptional service, the progression of seating over the last decade strikes me as an overall reduction in passenger comfort. What lies ahead? The suites do get redesigned periodically, and I expect that it will only be a few years before the worst aspects of the current design get changed. The trick is that actually replacing seats takes a long time (as evidenced by my flying just today on a plane still configured with the leather armchairs for a decade ago). Once a misstep makes its way into circulation, it stays for a long time.